A sheriff is facing growing calls for his firing over his officers’ response to the school shooting in Parkland, Fla. THE LEAD STORY – CONGRESS UNDER THE GUN: After a 10-day break that saw 17 killed during a Feb. 14 school shooting massacre in Parkland, Fla., Congress returns to work Monday under pressure to act on gun violence. 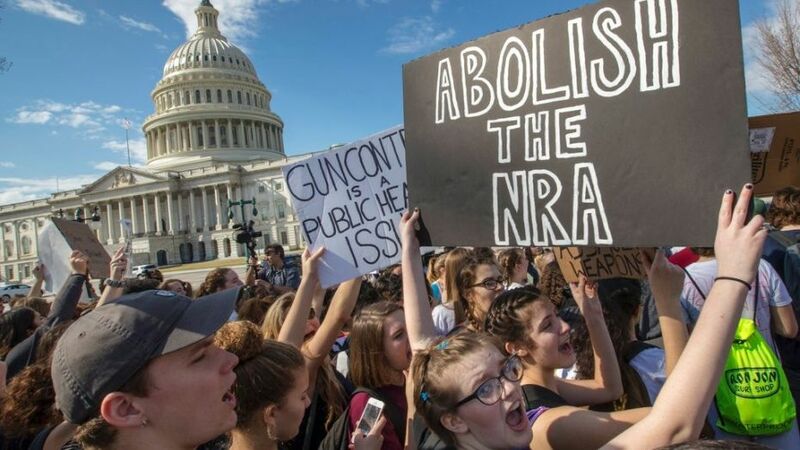 But a plan of action may be elusive … No plan appears ready to take off, despite a long list of proposals, including many from President Trump, who told the nation’s governors Sunday that the Parkland massacre will be a top priority in upcoming White House meetings. Republican leaders mostly have kept quiet for days as Trump tossed out ideas, including raising the minimum age to purchase assault-style weapons, strengthening background checks and arming teachers. ‘HE IS RESPONSIBLE FOR THIS MASSIVE FAILURE’: Florida Gov. Rick Scott is facing a growing number of calls to remove Broward County Sheriff Scott Israel over his department’s response to the Parkland massacre … Florida House Speaker Richard Corcoran sent a letter to Scott on Sunday asking the governor to suspend Israel. A day earlier, State Rep. Bill Hager urged Scott to relieve Israel from his duties for “neglect of duty and incompetence,” the Palm Beach Post reported. In addition, a survivor of the shooting told Fox News on Sunday that the sheriff had to go. “He failed to act on so many different levels and him himself, he is responsible for this massive failure. It could have been easily stopped both by the FBI and the sheriff’s department had they acted,” Kyle Kashuv told “America’s News HQ.” The call for the sheriff’s removal comes after it was revealed that several Broward sheriff’s deputies waited outside rather than rush in as the alleged gunman, Nikolas Cruz, gunned down students at Marjory Stoneman Douglas High School. THE DEBATE OVER THE ‘DIRTY DOSSIER’ RAGES ON: The release of Democrats’ rebuttal to the GOP FISA memo alleging government surveillance abuses did little to settle any debates over the Russia investigation ... The memo released Saturday is a rebuttal to the one by Republicans that argues the FBI and Justice Department relied on the loosely-vetted, much-discredited Trump dossier to get the warrant on onetime Trump campaign adviser Carter Page from the Foreign Intelligence Surveillance (FISA) Court. Rep. Jim Himes, the second-ranking Democrat on the House Intelligence Committee, attempted to minimize the importance of the dossier, telling “Fox News Sunday” it was only part of the evidence used to get a critical, court-approved surveillance warrant. “The application to warrant Carter Page was not based on the Steele dossier,” he said. President Trump dismissed Democrats’ rebuttal as a “total political and legal bust,” claiming that it only confirms the ”terrible things” that were done by the nation’s intelligence agencies. GORSUCH COULD BE PIVOTAL IN SUPREME COURT UNION FEES FIGHT: Mark Janus has worked for years as an Illinois state employee, and pays about $550 annually to the powerful public-sector union known as AFSCME … While not a member of the union, he is required under state law to hand over a weekly portion of his paycheck – which he says is a violation of his constitutional rights. “I work for Health and Family Services, and I’m forced to pay money to a union that then supports political causes that I don’t agree with,” Janus told Fox News. Now, Janus’ free-speech fight is before the Supreme Court, which holds arguments in the appeal on Monday. The political and financial stakes are huge for the broader American labor union movement, which already has begun sounding the alarm about the consequences should the justices rule for Janus. The high court is being asked to overturn its four-decade-old ruling over so-called “fair share” fees, allowing states to require government employees to pay money supporting collective bargaining and other union activities – whether they join the union or not. The Supreme Court had deadlocked when the issue was revisited two years ago, just after Justice Antonin Scalia died suddenly. His Trump-picked replacement, Justice Neil Gorsuch, however, is expected to be the deciding vote this time around. SANCTUARY CITY DEFIANCE: The mayor of a sanctuary city in California tipped off illegal immigrant residents that ICE could be conducting a raid in the area, ratcheting up tension with the feds while giving her constituents an early heads-up … Libby Schaaf, the Democratic mayor of Oakland, shared the warning — which she said she “learned from multiple credible sources” — in a press release on Saturday, “not to panic our residents but to protect them,” Fox 2 reported. California Democratic Party doesn’t endorse Feinstein re-election bid. DACA recipient threatened to ‘shoot all of ya b—-es’ at NY high school, police say. Transgender boy wins girls’ state wrestling title for second time. Tax season stress: Here’s what Americans would rather do than prepare their taxes. The left’s fever dream of Mueller indicting Trump won’t happen, even if he finds something. Here’s why. Omarosa claims on ‘Big Brother’ she was shunned from White House meetings because she’s a black woman. Fox & Friends, 6 a.m. ET: Former Rep. Jason Chaffetz on Democrats’ rebuttal to the GOP FISA memo; House Majority Whip Steve Scalise on lawmakers facing pressure to act on gun violence; Eric Trump on his father’s latest clashes with Democrats on the FISA memo, the Russia dossier and collusion; former White House Chief of Staff Reince Priebus separates fact from fiction on the rumors about his tenure in the Trump administration. The Story with Martha MacCallum, 7 p.m. ET: Rep. Peter King on the Democrats’ rebuttal to the GOP FISA memo and the implications for the Trump dossier. Hannity, 9 p.m. ET: Former Trump campaign adviser Carter Page responds to the release of Democrats’ rebuttal to the GOP FISA memo. Fox News @ Night, 11 p.m. ET: texas Attorney General Ken Paxton and Wisconsin Attorney General Brad Schimel give Shannon Bream a first look at the lawsuit that’s finishing what Congress couldn’t. The Fox News Rundown podcast: Fox News’ Eric Shawn and Tom Fitton, president of Judicial Watch, take a closer look at the Democratic rebuttal to the Republican committee memo about domestic spying. Plus, commentary from Judge Andrew Napolitano. The Brian Kilmeade Show, 9 a.m. ET: New York Post columnist Michael Goodwin on how the government failed the students in the Parkland, Fla. massacre; David Bach looks ahead at the week on Wall Street and the Trump economy; Jason Chaffetz on the Democrats’ rebuttal memo; Harry Kazianis on the Olympics and the implications for U.S.-North Korea relations.